The 5 Star CC24 Cross-Cut Shredder is suitable for either home or small office use and will shred up to 24 sheets of paper at a time. With a shredded particle size of 4 x 40mm, this shredder has a P-3 security level rating - so it is ideal for the shredding of confidential documents. Bin size is an ample 28 litres and there is no need for removing staples or paperclips prior to shredding. 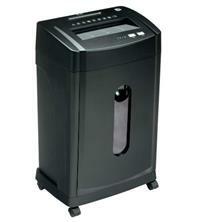 As well as getting through these, the CC24 shredder will also shred credit cards, CDs and DVDs. Other features include: auto start/stop; a reverse option to help clear any paper jams; an indicator light if the shredder door is left open (the shredder also disables if this happens during shredding); an overheat function (with LED light to indicate the shredder needs to be left to cool down); and a 225mm (A4) throat width. Warranty on the 5 Star CC24 Cross-Cut Shredder is 2 years for both machine and cutting blades.